Martha Gradolf Winnebago's work, "Made in Japan." Winnebago is the Native American Heritage Month feature artist. October is the time to commemorate the rich and diverse heritage of Native Americans, and Wright State University is gearing up to do just that. Students, staff and faculty are welcome to participate in events that celebrate Native American cultures from Cherokee to Choctaw. Throughout the month, events such as film screenings and art shows will take place across campus. Martha Gradolf (Winnebago) weaves because it connects her to the ancient ones. Her one-of-a-kind woven wall hangings often embody a subtle message. She weaves the beauty and truth of many cultures into webs. Her art is contemporary and non-traditional and addresses Native issues such as stereotypes, history, humor and topical commentary. 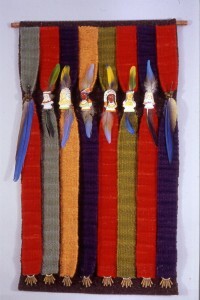 Gallery hours: Monday–Saturday, 8 a.m.–10 p.m.; Sunday, 10 a.m.–10 p.m.
LeAnne Howe (Choctaw) journeys to the North Carolina homeland of the Eastern Band of Cherokee Indians and discovers how their fusion of tourism, cultural preservation and spirituality is working to ensure their tribe’s vitality in the 21st century. Journalist Mark Anthony Rolo (Bad River Ojibbwe) sets out to learn how urban Indians in Los Angeles parallel his own life as they preserve a tribal identity, survive economically and cope with the pressures of a federal relocation program and assimilation in a multicultural metropolis. Dream catchers are one of the most fascinating Native American traditions and have been a part of Native American culture for generations. Join us and make your own dream catcher. Mohawk storyteller Kay Ionataiewas Olan will discuss why storytelling is an important part of Native American culture. Olan will share stories that have been passed down through the oral tradition of the Haudenosaunee (Iroquois).